Bold move, considering South Korea for a holiday, and to write a series of travel stories. Don’t know a soul in Seoul, but I do delight in cuisine, music, dance, cities and gardens. And I trust National Geographic ranking South Korea’s capital city #10 in a list of 65 of the world’s most influential cities. Who knew? I’m preparing to sort out the facts, and the excitement. Here are my planning steps for such an adventure. Food first, and my first course: Jap-chae. That’s potato starch noodles mixed with stir-fried vegetables and beef. Simple sauce of soy, sesame oil, garlic and spring onions. 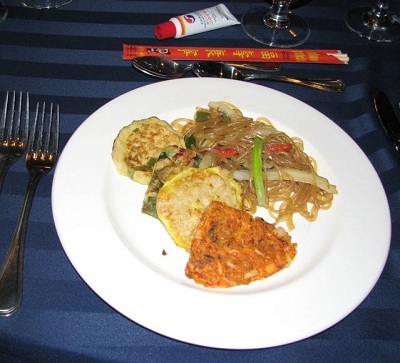 Note the red cap on the little tube of Korean hot pepper paste. This heat is distinctive. Next round of seasoning while I tried my first-ever Korean dinner was not so simple: the red cap on the little tube of Gochujang, Korean hot pepper paste, was my clue to squeeze just a dab on the side with my main course known as Bibimbap. 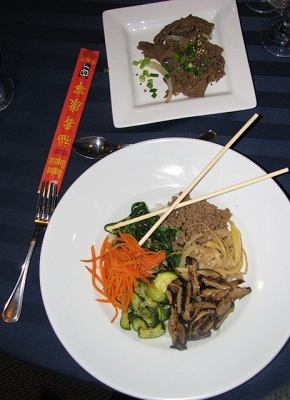 Korean Americans in the know, however, at my dinner table in Jimmy Carter’s Presidential Library in Atlanta, added generous amounts all over the rice topped with cooked and seasoned vegetables so I did too. Got over the shock and I’m prepared now to dine on this rich and healthy food with the locals when I get there. Pancakes South Korea style involve kimchi stirred in a flour mixture and pan-fried. Also gave a tube of Gochujang to my sons – boys I birthed who studied abroad, travel adventurously and recognize fine cooking. Inviting to dinner the adult son blended by marriage who traveled widely too. Cool-temp big-flavored tea with dessert: dried persimmon, cinnamon and ginger balancing a plate of chewy steamed and pounded rice cakes. Next I’m going to lunch at Stone Bowl, on Atlanta’s international Buford Highway. Maybe I’d be wise to take a side trip to Manhattan since the Korean Cultural Service in New York could point me to museums and performances. I want to hear ancient Korean group drumming and 25-string instruments. 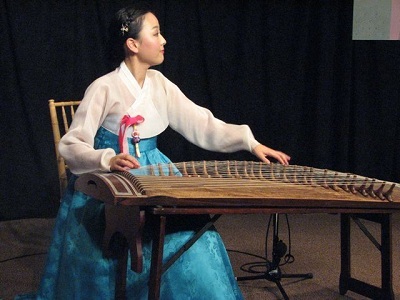 Twenty-five strings on this traditional instrument called a gaygeum. Samulnori I believe is the name of the drumming dance to behold, a long ribbon spinning from the top of the drummer/dancer’s hat. After that, hopefully Korean Air to Seoul. They’ll serve Bibimbap too, and offer language lessons and currency exchange classes. I’m studying the literature and the cookbooks and dreaming big about staying in a temple, and small community home, about walking tours on Jeju Island, a UNESCO Natural World Heritage Site, and experiencing Seoul. Top photo: National Geographic magazine says Seoul is a leading city of influence in the world.